Combine all ingredients in a small glass jar. GENTLY stir (to prevent the solution from foaming up) with a non-reactive (non-metal) utensil, making sure the mixture is evenly combined (no blobs of shampoo, etc.). Store in the closed jar. To use, pour a small amount into a glass prep bowl (I picked up several of these little bowls at the dollar store since I also use them in the kitchen all the time). Dip the brush into the cleanser, being careful not to get cleanser in the ferule (the metal part of the brush that connects the bristles to the handle; over time, water and cleanser can dissolve the glue holding the ferule on the brush handle), then stroke the brush back and forth across your fingers until the cleanser begins to suds up. Gently massage the bristles, working the cleanser into the bristles to break up oil and makeup deposits. Holding the brush at a downward angle, rinse the bristles under lukewarm water, gently working the water through the bristles until the water runs clear. For particularly dirty brushes, repeat the process 1 – 2 times until the rinse water runs clear after only a few seconds of rinsing. Let the brush air dry; fluff before use. If desired, pour some of the brush cleanser into a fingertip sprayer for daily quick cleaning. Lightly mist the bristle tips of a brush, then gently stroke the brush back and forth across clean facial tissue to release oil and makeup buildup from the bristles. Repeat until brush strokes are clean (no colour deposited on the facial tissue). Let the brush air dry (this should only take a few minutes after a quick cleaning; if it takes a long time for the brush to dry, use less cleanser so the bristles aren’t saturated). (1) It was 10pm when I got a wild hair about cleaning my brushes (what is it with me and middle of the night compulsions? Yeesh). Not having any distilled/purified water in the house — and refusing to get dressed and drive to a store for <$1 worth of water late at night — I solved the problem with a time-tested, low-tech solution: I simply boiled tap water on the stove and then let it sit and cool to room temperature. (2) I typically use blue Dawn (original, non-ultra), since I always have it on hand for other things — everything from cleaning metal jewellery components to making miracle stain remover for laundry (that will have to be another post soon!). (3) My shampoo is Aveda madder root shampoo, which I’m not about to use to clean my brushes (Do I need to “enhance the non-existent red tones” in my brushes? I don’t think so. ), so I helped myself to some of Glam’s Suave Naturals Daily Clarifying Shampoo instead. I’ve also had good results in the past using Aveda’s shampure (TM) shampoo, but I don’t happen to have any right now. (4) EnKore says specifically NOT to use a cream leave-in conditioner or other thick product, and since that’s what I use (Aveda color conserve (TM) daily color protect), I raided Glam’s bathroom again: we’ve used Influx33 leave-in conditioner on her hair for YEARS; it may still be available locally from Sally Beauty, but they no longer carry it online. Any sprayable leave-in conditioner should work. How do you clean your makeup brushes? 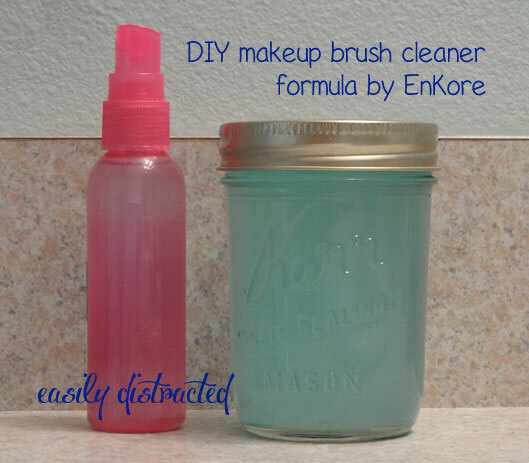 Will you try DIY brush cleanser? Hi Tanya, thanks so much for sharing this recipe. I was wondering if you could recommend the purest brand of essential oils. I have a serious health condition and am trying to find one that I can ingest. Thank you! Hi Ann! I honestly don’t know which brand of EOs is “purest,” sorry. I have EOs from several sources, including Young Living and doTerra, but only because I have family or other associates who work/ed at those companies (the YL and dT EOs were gifts–I have no interest in buying their products, for a variety of reasons, but product quality wasn’t really a consideration for me avoiding them). The EOs I’ve purchased are all from three sources: Essential Oil University (http://essentialoils.org/), which has unfortunately (IMO) stopped selling EOs, at least direct to consumers, because I really loved his HUGE selection and reasonable prices; Essential Wholesale & Labs (http://www.essentialwholesale.com/), which I’ve been really happy with; and New Directions Aromatics (http://www.newdirectionsaromatics.com/), which I also like very much. I can tell you that I don’t ingest the EOs I use; I apply them topically, so they’re absorbed through my skin into my bloodstream, and that seems to work just fine for me. Good luck!